Google's stock email application has long felt like a last-minute addition to the Android operating system--especially since the company's own proprietary client, Gmail has long been the superior mail client. But not everyone uses Gmail, and unless you download a third-party application, the built-in Android email app is your only choice for connecting POP3, IMAP, and Exchange accounts. Fortunately, Google has finally paid some mind to its neglected email client in Android 4.4 KitKat. It's been dressed in Gmail's new interface and now features the easier-to-navigate menu system that's become standard across many of Google's core apps. 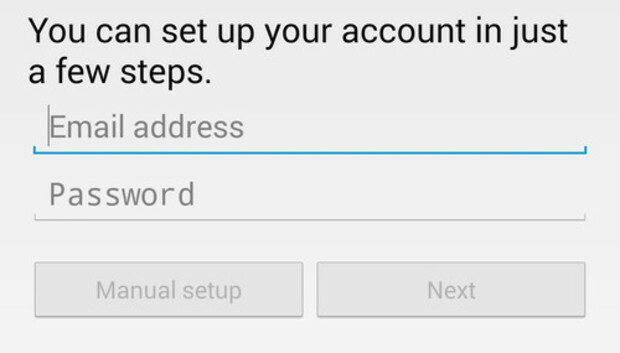 The process for setting up your email account in Android's stock email app is the same as it's always been: you type in your email account from the main set up screen, but you may need to select Manual Setup to get anywhere further than that. From there, you can select whether or not you want to set up a POP3, IMAP, or Exchange account. Alternatively, you can also add the account from within the Settings panel, under Accounts. Once you've entered your credentials, your mail will begin to sync immediately. You can also set up your Gmail account to push through to this application if you utilize more than one email service and would rather keep all messages contained in one application. As in the Gmail app, you'll see the swanky bold-lettered design applied to the new email app. Bear in mind that this is only compatible with Exchange and IMAP accounts and you won't have access to the same thread view that Gmail utilizes. If you do set up the app to receive your Gmail messages, any filters you applied in the browser won't work here. The little things have been overhauled, too: now the email menu resides at the top instead of messily at the bottom like it did in Android 4.3, and you can tug down to refresh your inbox any time you choose. Both the Gmail and Email apps now appear virtually identical. The new stock Android email app uses the "hamburger" menu, which slides in when you drag your finger in from the outer left bezel. Here you'll be able to switch between accounts or select "combined view" to get all of your emails in one window. You can also switch between the folders in each email account, which you won't be able to do from the combined view. Lastly, be sure to check out the newly overhauled Settings menu. Now you can choose your syncing intervals directly from this menu rather than digging for it through the Settings panel, as was standard practice in Jelly Bean. You can also choose your name, set up your signature and Quick responses, and choose sync frequency and whether or not to automatically download attachments to avoid any data overages when you're not on Wi-Fi.